ormer Fab offers various upgrades to your existing Hayssen VFFS baggers under our Gentry Packaging brand. We can tailor the upgrade of your bagger. We offer mechanical upgrades, and now offer controls system replacement. The control system has a proven track record with dozens with this design in operation in many production facilities. The Former Fab Hayssen control rebuilds include 3 primary hardware modules. First, there is a new back panel with all new control mounted within the existing enclosure. Secondly, there is a new operator station mounted over the top of the old operator station. 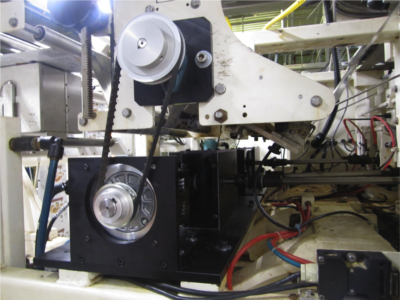 Finally, there is a servo fixture that mounts into the center of the machine and connecting to the pull belt shafts and registration roller. In short, the rebuild provides all new controls and new servo operation. Existing wiring mounts to the new control panel, and the servo fixture easily couples to the rollers and belts. Bagger rebuilds are generally done on site by trained Former Fab specialists in about three days. Customers have new controls and enjoy many benefits such as higher speeds, less setup and scrap, less downtime and less maintenance. The Hayssen control package includes an Allen-Bradley 1400 PLC with additional modules. There is a temperature module providing integrated temperature control to the PLC and touch screen. This allows recipe set points and alarms. The 7″ Allen-Bradley color touch screen provides a wealth of operator functions, status, messaging, and recipes. The servo system uses Mitsubishi MR servo drives. These have built in registration control for very accurate film stop and positioning. There are other control components and all are built into a custom size back panel that will fit the existing enclosure. The controls are “off the shelf” and familiar to maintenance personnel. The PLC connects existing wiring to its modules and controls all machine functions. Former Fab does all feeder integration along with training and production startup. Former Fab can customize installations to the exact needs. Schematics and bill of material lists are provided. Former Fab provides ongoing controls support, and a WiFi router comes as standard equipment for remote access for our engineers to diagnose or make custom updates for you. There are more than a dozen helpful operator screens. Machine adjustments can be made while the machine is running. The main screen provides film jog, tracking, single/continuous bags, and empty and full bags. Once setup (or a recipe loaded), this main screen is all that is needed. Other screens set the machine speed, actual speed, and bag counters. Two screens show machine timing and can be adjusted using a 0-360 on/off selection for all actuators. This is similar to the original Hayssen screen set-up. Another screen allows temperature adjustment for sealing with alarms. The Bag screen provides bag length, film registration, placement, and film setup. A recipe screen provides a means to save and load all machine setup variables for rapid setup. There are screens to jog the motors and to actuate the valves one at a time manually. There are screens for setup of scales, augers, and adjustments of film tension. Options include using different languages, adding Bill of Material list, or maintenance information. 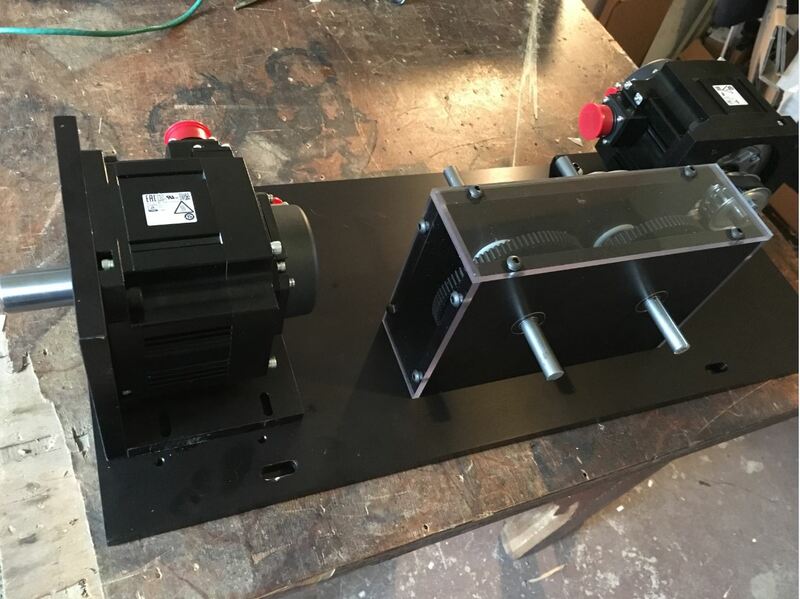 The servo fixture is built to mount and easily couple to the existing registration roller and pull belts. The fixture is machined with high grade ½” aluminum and all is anodized. There are 2 servo motors. One is coupled overhead to the registration roller with a timing belt. The other motor uses a timing belt system to run a pair of spur gears that are then coupled to the 2 pull belts shafts. In this way, the timing pulleys provide twice the torque advantage over a direct drive system. These 1KW motors provide plenty of power. 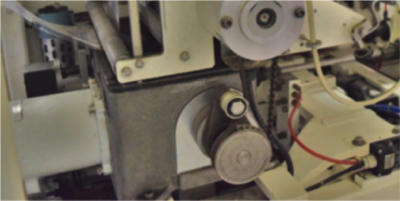 In one extreme case, a customer lost the registration motor and was running the machine just with the pull belts. Other applications have had these servo motors running 76 bags/minute for 20 hours a day. The motors always stay cool. No matter your VFFS machine, the controls can be upgraded and made modern giving your machine superior operation and functionality. It will look and run like a modern bagger and perform as well as any competitive bagger in its class. With higher speeds, reduced scrap and maintenance, customers often pay for the control upgrade in a very short time, sometimes just months. Let Former Fab evaluate your needs and provide a great solution. We stand behind and support this control system, as we do all our products. Former Fab has a in house demo unit you are welcome to come check out. “On the Fly” adjustments of Speed and bag Length. What comes with a typical Former Fab Hayssen controls upgrade? 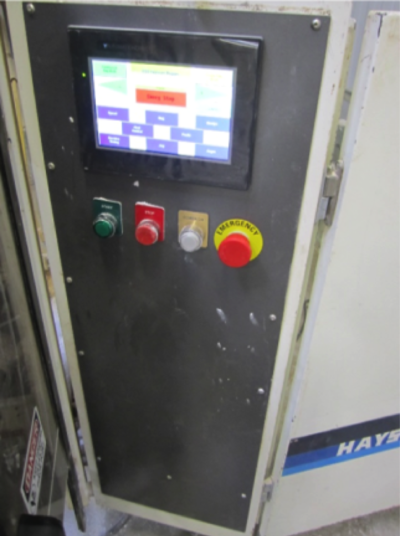 Before – Older Hayssen dedicated Proprietary push button controls. 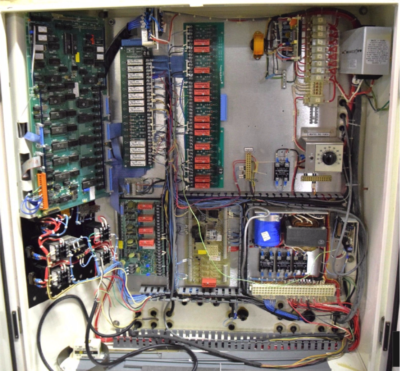 We remove the entire old operator control panel and replace with an Allen-Bradley touch screen. The old integrated circuit chip control was fixed and inflexible. The touch screen can be programed and customized as per your specific needs. Before – The older transmission box and DC motor are removed. 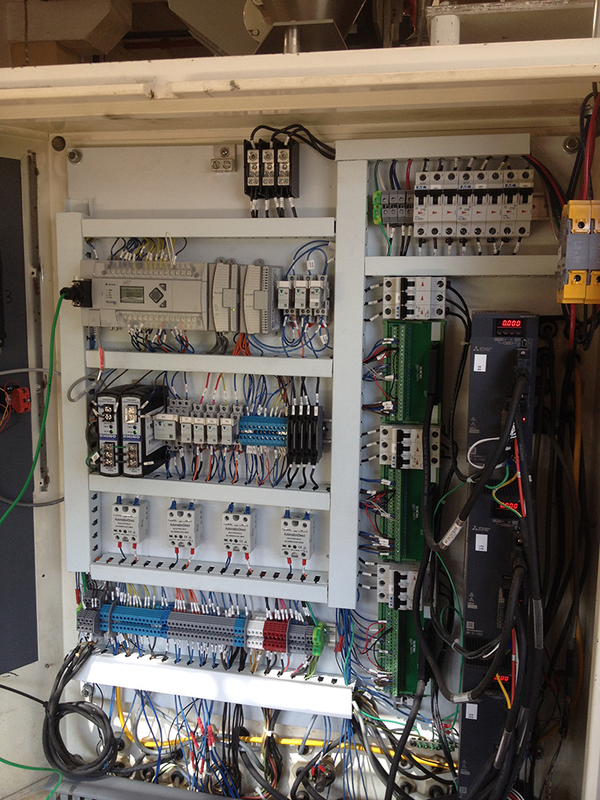 After – The brand-new Allen Bradley PLC based control panel with Servo drives is installed.